It has been five years since we officially celebrated Chris Van Allsburg's birthday. 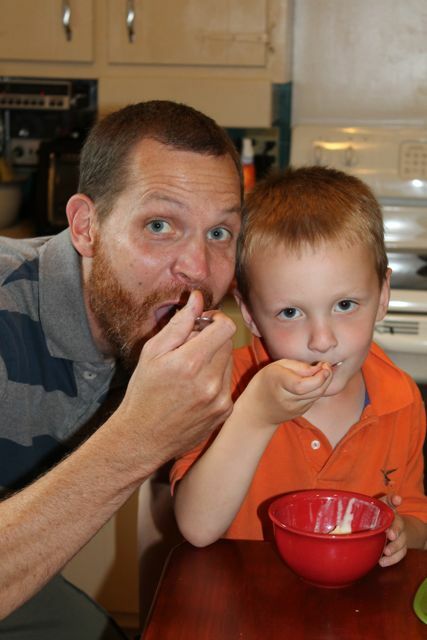 I am a little embarrassed by the blog post I wrote back in 2010. I have often thought, I should delete my poorly written old blog posts. Thankfully, each time I have thought this I have decided to keep them, all of them. Those old blog posts remind me of how far I have come as a writer, a father, and an author-birthday-celebrator. 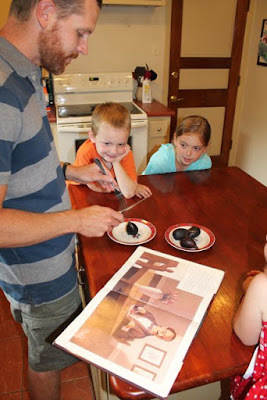 Back in 2010, the blog post for Chris Van Allsburg's birthday was the best I could do. This blog post is the best I can do in 2015. With each blog post, I learn a little bit more about writing, a little bit more about myself as a person, a little more about children's literature. But, most importantly, I continue to see evidence of the value of reading to my children. 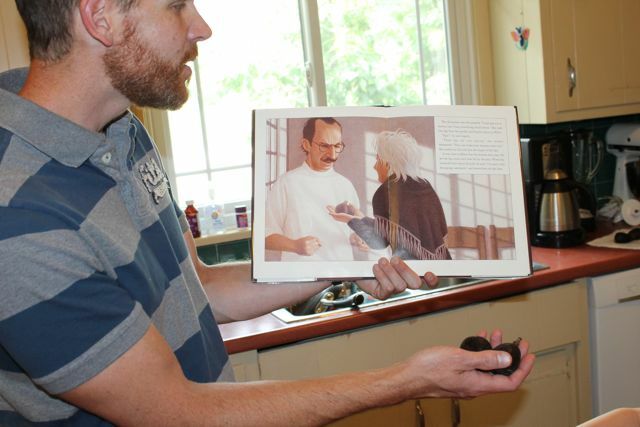 And therefore, if my dreams come true, there will be another Chris Van Allsburg birthday celebration in my future. Chris Van Allsburg is the author-illustrator of over fifteen picture books including The Polar Express, Two Bad Ants, and The Wretched Stone. Surprisingly, he didn't take art classes in high school, but decided to study art at the University of Michigan where he later graduated with a degree in sculpture. He continued his studies at Rhode Island School of Design and was exhibiting his work at art galleries within two years after his graduation. Then, he made some casual drawings that caught the attention of his wife, an elementary teacher, who showed them to her friend, David Macaulay. They both thought that Chris' drawings could be children's book illustrations. Van Allsburg was introduced to Macaulay's editor who encouraged him to write a story in addition to his illustrations. All of this led to his first book, The Garden of Abdul Gasazi which was awarded the Caldecott Honor in 1980. (HMHbooks). He followed up this successful book with another, Jumanji, the Caldecott Medal Winner in 1982. For Van Allsburg, it has been one great book after another throughout his entire career. Many of his books have been made into successful movies including The Polar Express (1986 Caldecott Medal Winner), Zathura, and Jumanji. More recently, Van Allsburg's artwork was used for the Grand Rapids Ballet production of The Nutcracker in 2014. Check out Chris' latest picture book, The Misadventures of Sweetie Pie which was released in November 2014. I found two quotes by Chris Van Allsburg from an interview with Cooperative Classroom that I feel sum up why my family loves his books so much. The first quote, "I am attracted to the idea of seeding the imagination by leaving something untold." My family had great conversations trying to figure out exactly what happened in books like Probuditi, The Widow's Broom, and The Garden of Abdul Gasazi. There really is nothing like seeing your seven-year-old truly perplexed by a picture book. And the second quote, "My approach to fantasy has always been that there's only going to be one fantastic notion, or one supernatural feature in the story [and] everything else has to follow the rules that we're familiar with." This makes Van Allsburg's stories so believable! 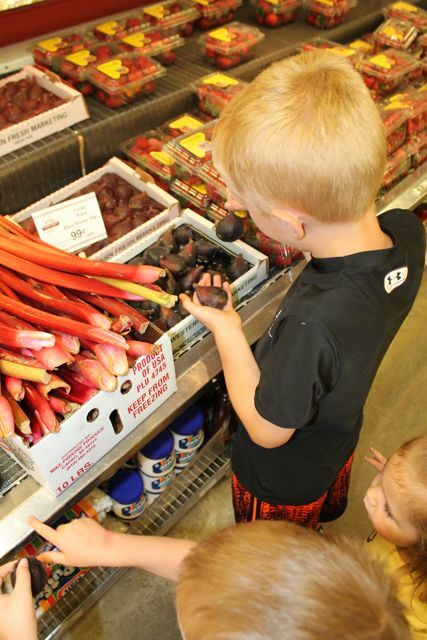 This week, I saw this first hand when my youngest children truly believed we were going to the market to buy magical figs to make their dreams come true! It is hard for me to pick a favorite book by Chris Van Allsburg, but The Sweetest Fig is near the top. 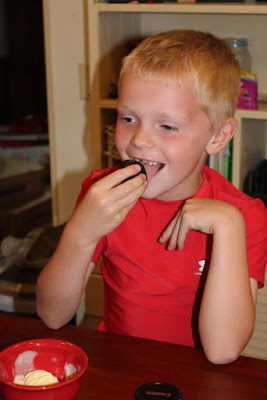 When I reread this book this week, I thought it would be fun to eat figs with my children. I, too, wanted a reason to eat a fig since I had never eaten one myself. Luckily, I learned that figs are available in two seasons during the year; one in early summer starting in June and another in late summer that starts in August that lasts until fall. (Source). I found Black Mission Figs at our local market. I wonder if these are magical figs that make your dreams come true? 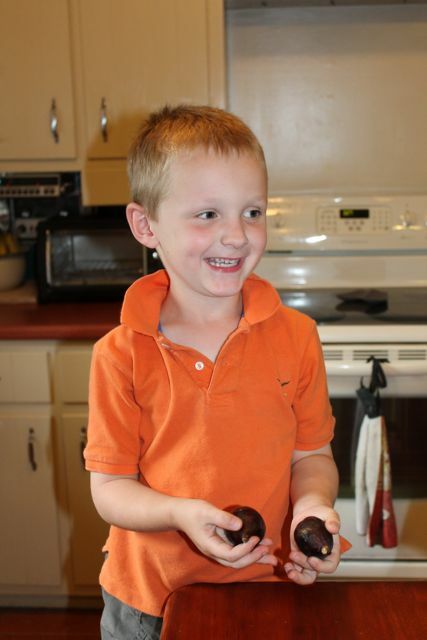 My three youngest children each picked out two figs that they hoped would make their dreams come true. They also picked out two for their older sister. I think this was his "Magical Fig" dance. 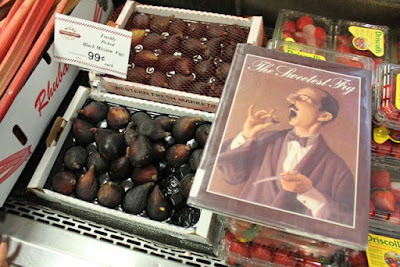 When we checked out I asked the cashier if these were magical figs like the ones in our book. 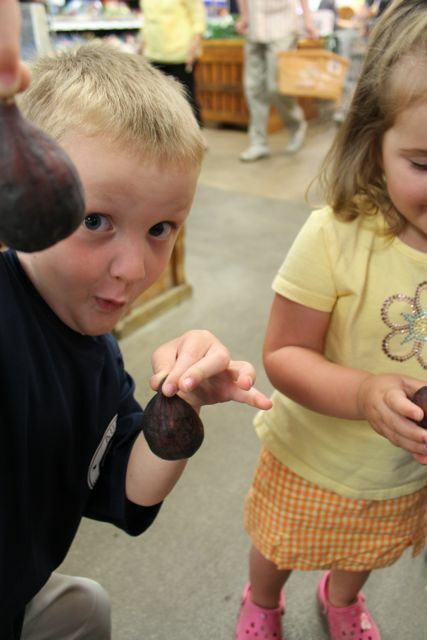 The cashier caught on and said, "Yes, we only sell magical figs here!" My children's eyes widen and smiles immediately appeared on their faces! "These figs are very special," said the woman. 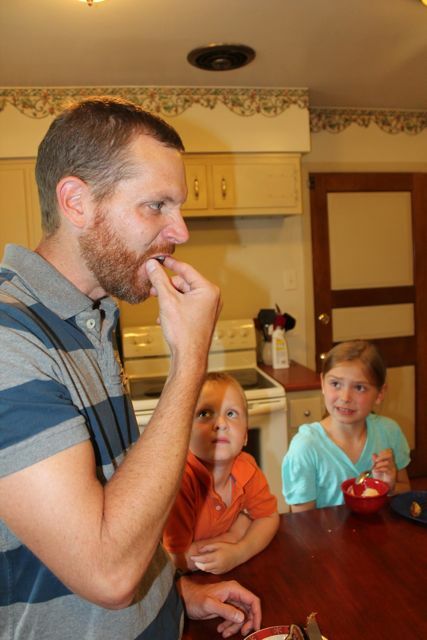 I asked my children, "What dream of yours do you hope comes true when you eat the figs?" 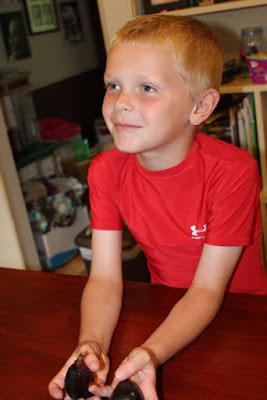 My son had a very Bibot-like response, "My dream is that everything will be made of money." "My dream is that I will be the richest man in the world." "My dream is that I will be a princess." 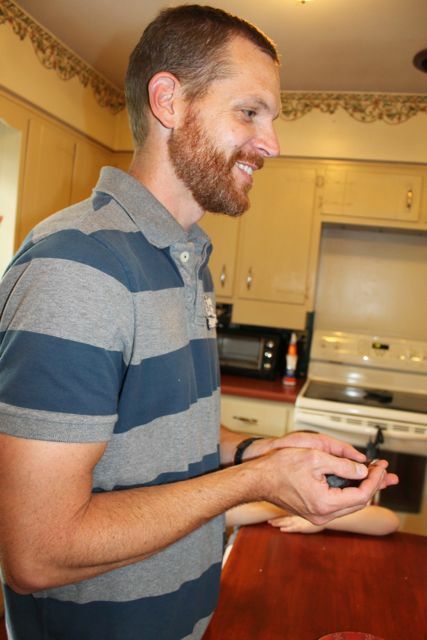 I said, "My dream is that some day I will have a best-selling children's picture book." 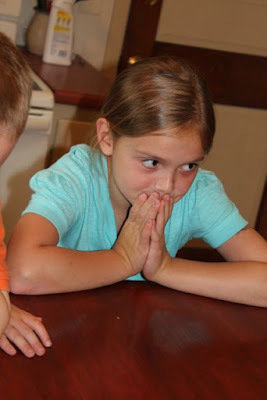 However, it is clear, after writing this post, that a more important dream would be for these reading experiences with my children to continue for many years to come. Now, for our dreams to come true we had to eat the figs. I prepared to cut them just like Monsieur Bibot. 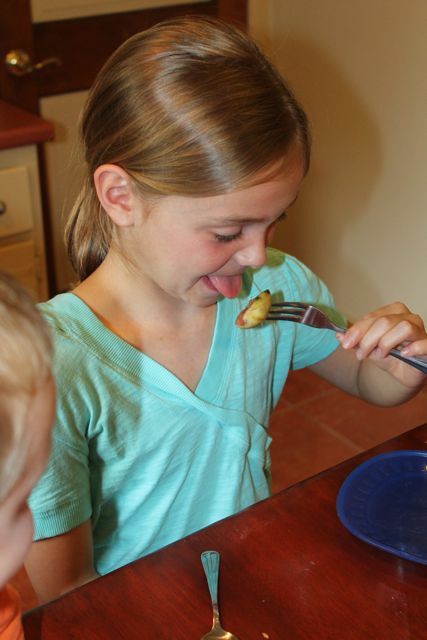 My oldest daughter was not liking the idea of trying the figs. I even tried peeling off the skin. She would only lick it. I bought vanilla ice cream, which I read was delicious with figs, but she wouldn't try the fig with ice cream either. I decided to be brave and I popped the piece of fig right in my mouth. 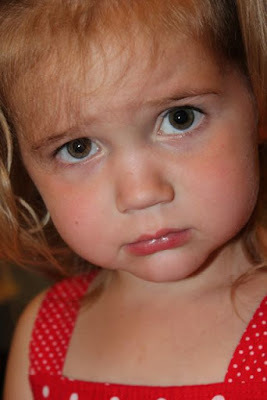 I love my daughter's face!! My youngest son, ATE IT! I was so proud of him for being brave. His dreams are going to come true! Was my youngest daughter going to eat it? I don't think so. But, she didn't need to eat it. She is already a princess! Yum! These were the sweetest figs we have ever had. 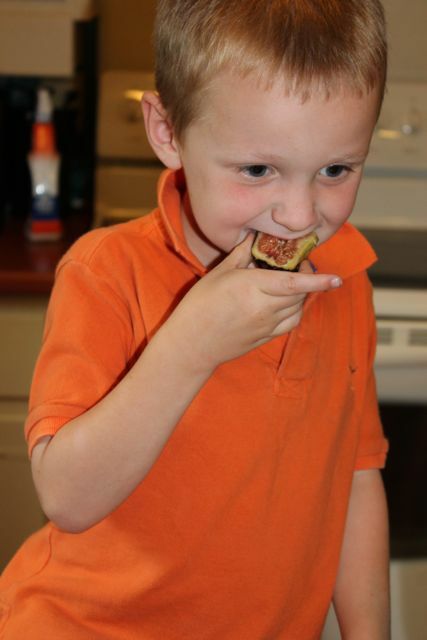 The vanilla ice cream was delicious with the figs too! 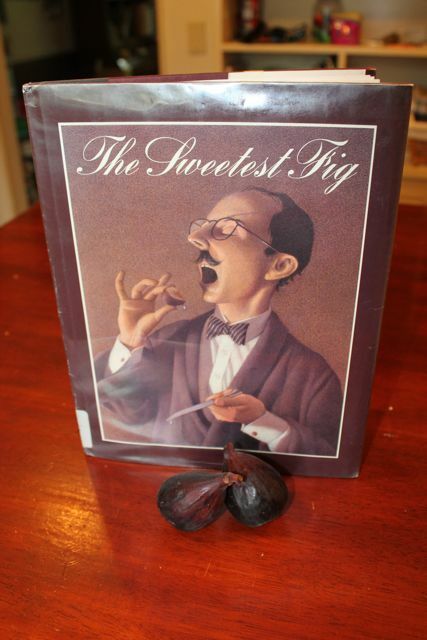 I must say, The Sweetest Fig, is now one of our TOP 5 favorite books by Chris Van Allsburg! In closing, I decided I shouldn't be so hard on myself about the blog post back in 2010. In that post, I shared a worksheet I called "Where's Fritz?" This worksheet helps you keep track of your efforts to find Fritz, the dog, who is in each of Van Allsburg's picture books. 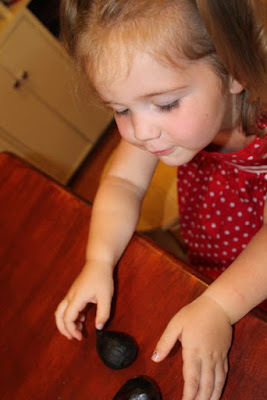 This year, my five-year-old son loved the worksheet and it motivated us to read more books just to find Fritz! Watch Van Allsburg talk more about Fritz below and click here to download an updated version of the "Where's Fritz?" worksheet!